The Bedouin valued pure in strain horses above all others, and many tribes owned only one main strain of horse. the five basic families of the breed, KNOWN AS "AL KHAMSA" include Kehilan, Seglawi, Abeyan, Hamdani, and Hadban. AlKhamsa are descended in all lines from the bedouin's desert horses. we the strains were bred pure, they developed characteristics that made them identifiable. The Abeyan;they were also refined and had longer backs than the typical arabian. These horses were usually small,gray,and more white markings than other strains. the Hadban,were smaller versions of the athletic Hamdani;they kept the muscular frame despite their average size of 14.3 hands. 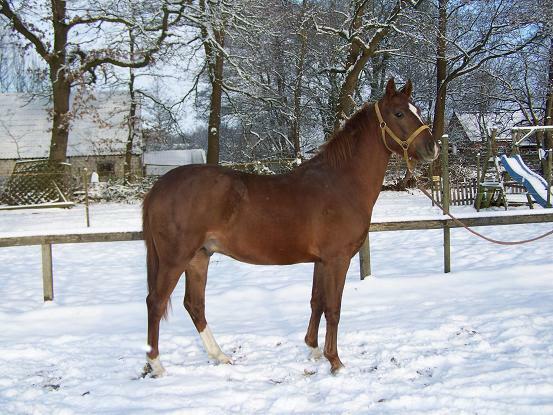 Most Hadban arabians are bay or brown with little white . These strains were later developed into "NATIONALITIES" Where the names refer to the countries of origins. from "History and Heritage of the arabian horse"